DPS- Bopal has produced National Level Rifle and Air Pistol Shooters. 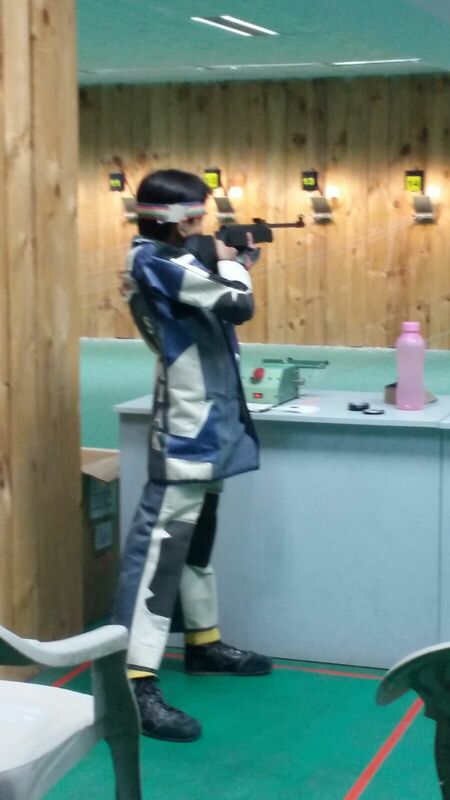 We have a rifle shooting range with professional coaches at our Bopal campus. (1)Paranjay Singh of class 11 E , qualified and participated in the 64th National School Games 2018-2019 organized by SGFI held at The Emerald Heights International School , Indore from 14th December 2018 to 20th December 2018. He represented Gujarat and bagged a Team Bronze medal in the .177 Open Sight Air Rifle event. (2) Paranjay Singh of class 11 E participated in the state level SGFI Rifle Shooting tournament and got the silver medal in 10m .177 Open Sight Air Rifle event. The competition was held at Ahmedabad Rifle Club , from 6th to 8th December, 2018 and he has qualified for SGFI NATIONALS going to being held at Indore from 13th to 20th December. 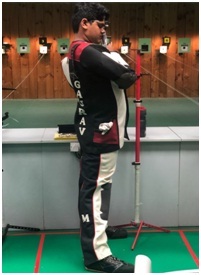 (3) Gaurav Mishra of class 11 Y participated in the state level SGFI Rifle Shooting tournament and got the bronze medal in 10m .177 Peep Sight Air Rifle event. The competition was held at Ahmedabad Rifle Club , from 6th to 8th December, 2018 and he has qualified for SGFI NATIONALS going to being held at Indore from 13th to 20th December. (1)Paranjay Singh of class 11 E, qualified and participated in the National Shooting Championship Competition (NSCC) organized by the National Rifle Association Of India (NRAI) held at Trivandrum, Kerala from 20th November 2018 to 26th November 2018. He represented Gujarat in the national tournament in the Youth .177 Peep Sight Air Rifle event. 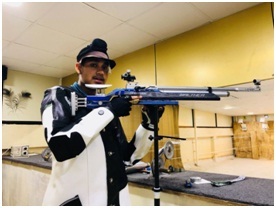 (2)Gaurav Mishra of class 11 Y, qualified and participated in the National Shooting Championship Competition (NSCC) organized by the National Rifle Association Of India (NRAI) held at Trivandrum, Kerala from 20th Novemeber,2018 to 26th November,2018 . He represented Gujarat in the national tournament in the Youth, Junior and Senior .177 Peep Sight Air Rifle event. He also qualified for giving the trials for the National Squad. Akshat Shah of IX – J participated in the 54th Gujarat State Rifle Shooting Championship which was held at Baroda on 16 July 2018. He won Gold Medal in Youth Championship and a Silver Medal in Senior Championship. Gaurav Mishra, of XI Z participated in the Ahmedabad District Rifle Shooting Tournament held at Rifle Club on 7/7/2018, and got 3 Gold in OPEN MEN, JUNIOR MEN AND YOUTH MEN Category. Pranjay Singh of XI E participated in the Ahmedabad District Rifle Shooting Tournament held at Rifle Club on 7/7/2018, and got 1 Gold in JUNIOR MEN TEAM Category and 1 Silver in YOUTH MEN TEAM Category. 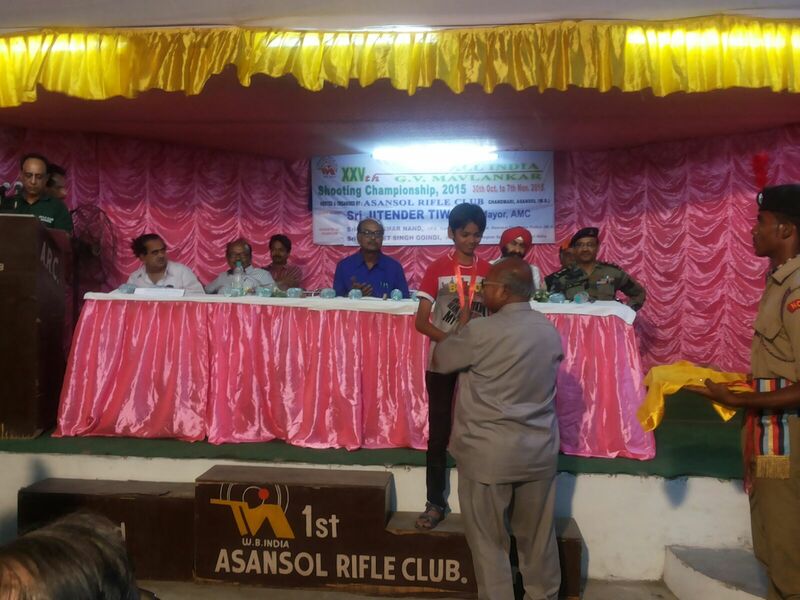 October-Nov.,2015 Samyak Shah of Class VIII won the Bronze medal with 378/400 score in XXV G. V. Malvankar National Shooting Championship Competition held at Asansol, West Bengal in Air Rifle Peep Sight Junior Men Individual Event. The SAG School Game District Level Rifle/Pistol Shooting Competition for U-17 boys and U-19 girls was organized at Rifle Club, Khanpur, Ahmedabad. Delhi Public School Boys and Girls participated and achieved 5 medals respectively. All these students are selected for State Level Tournament. DPS Bopal, Shooting team participated in SAG School Game State Level Rifle/Pistol Shooting Competition for U-17 boys category held at D.N. Shah School, Anand. KalravMehra of Class X B participated in Open sight Air rifle event, achieved Bronze medal in his category and also qualified for the National Level tournament. DPS -Bopal Shooting Team participated in the SAG School Game District Level Rifle/Pistol Shooting Competition for U-14 Boys & Girls category and U-19 Girls category held at Rifle Club, Ahmedabad. All these students participated in Open Sight Air Rifle Event and Air Pistol Event and qualified for the State Level Competition to be held at Baroda Rifle Club, Baroda. 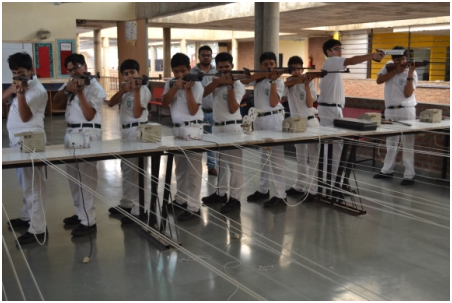 December,2015 Few students of DPS Bopal participated in 60th SGFI Shooting Competition held at Indore. Samyak Shah of Class VIII A won gold medal in individual rifle event and silver medal in team event. Gaurav Mishra of Class VIII D won silver medal in the team event.